Manufacturing sales rose 1.2% to $50.8 billion in June, the second consecutive gain and the third increase since January 2015. Despite the gains in June, year-to-date sales were down 1.5% from the same period in 2014. 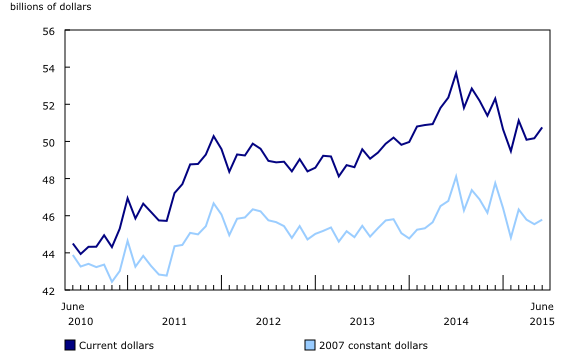 Constant dollar sales increased 0.5%, indicating a higher volume of goods sold. Sales increased in 18 of 21 industries in June, representing 80% of the manufacturing sector. Higher sales of chemical products and motor vehicles led the gains. Lower sales of fabricated metals partly offset the advance. Sales of chemical products rose 5.4% to $4.1 billion in June. Typically, sales of pesticides, fertilizers and other agricultural products peak in May and decline in June, once seeding in the agricultural sector has taken place. However, in 2015, some sales that normally occur in May took place in June. Motor vehicles also contributed to the overall gains, as sales rose 4.2% to $4.9 billion, the third increase for the industry in 2015. On a year-to-date basis, sales of motor vehicles were up 5.6% from the same period in 2014. Year-to-date sales are at their highest level since 2007, the year before the industry reported significant losses as a result of the recession. Sales of fabricated metal products fell 8.2% to $2.6 billion, partially offsetting the advance at the national level. A number of fabricated metal manufacturers bill upon completion of projects, which can take months or years to complete. This leads to volatility in their sales numbers. In June, some manufacturers tied to oil and gas extraction reported lower sales after finishing some long-term contracts in previous months. 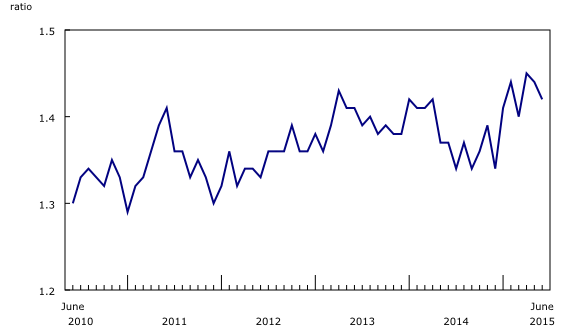 The gain in manufacturing sales was widespread in June, with seven provinces recording increases. Quebec posted the largest sales gain, followed by Alberta and Ontario. Declines in New Brunswick partially offset the growth. Sales in Quebec increased 2.9% to $12.4 billion, partially reflecting higher production of aerospace products and parts. The aerospace industry rose 5.3% as some manufacturers posted higher production. There were widespread increases in other industries, such as other transportation equipment, petroleum and coal products, as well as paper products. Sales increased in 17 out of 21 industries in the province. For a second consecutive month, sales rose in Alberta, increasing 1.9% to $6.0 billion. The gains reflected higher sales of chemical products, up 12.5% following a 7.2% decline in May. As with the industry at the national level, the increase reflects sales of pesticides, fertilizers and other agricultural products shifting into June. Lower sales of fabricated metal products partially offset the gains, down 17.8%, reflecting declines in the boiler, tanks and shipping containers industry. 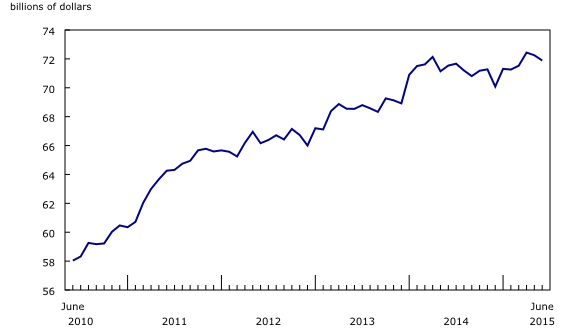 Following two consecutive decreases, sales in Ontario increased 0.4% to $23.5 billion. Motor vehicle sales were mainly responsible for the growth, increasing 4.1%. An 8.2% decrease in sales of fabricated metal products partly offset the advance. Lower sales of non-durable products in New Brunswick offset a portion of the national gains and led to the 4.7% decline for the province. Exports of refined petroleum products were down in June after peaking in May. Inventories declined 0.5% to $71.9 billion in June, the second consecutive drop. There were decreases in 12 of 21 industries, representing 67% of total inventories held. Machinery manufacturers posted a 3.1% decline, reflecting lower inventories on hand. Inventories fell 8.1% in the motor vehicle industry and 1.3% in the aerospace products and parts industry. Finished products decreased in both industries, as manufacturers shipped more products to their customers in June. Inventories were also down in the petroleum and coal product industry (-2.2%). The inventory-to-sales ratio fell from 1.44 in May to 1.42 in June. The inventory-to-sales ratio measures the time, in months, that it would take to exhaust inventories if sales were to remain at their current rate. Unfilled orders continued their slide, down 1.8% from May to $93.8 billion in June. Compared with January, unfilled orders were down 6.6%. With this most recent decline, unfilled orders have fallen for five consecutive months, a trend that has not occurred since 2009 when unfilled orders dropped 14.3% over a similar five-month period. Most of the decrease in June was a result of lower unfilled orders in the aerospace product and parts industry. A portion of the decline in aerospace products and parts reflects an appreciation in the Canadian dollar in June. Given that the majority of unfilled orders in the aerospace industry are held in US dollars, fluctuations in the value of the Canadian dollar relative to the US dollar can influence trends for the industry. 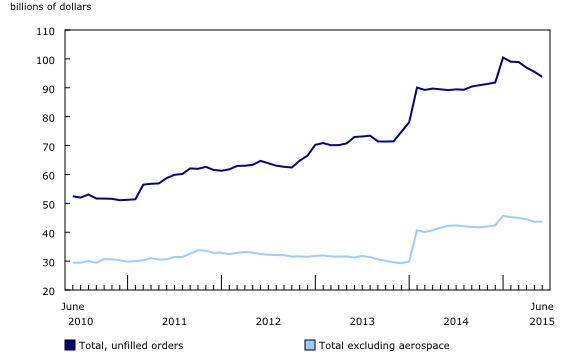 Excluding the aerospace industry, unfilled orders were unchanged from May. New orders rose 0.6% in June, reflecting widespread increases led by the computer and electronic product industry as well as the chemical product industry. The gains were offset by declines in the aerospace industry. Monthly data in this release are seasonally adjusted and are expressed in current dollars unless otherwise specified. For more information on seasonal adjustment, refer to the document Seasonally adjusted data – Frequently asked questions. Durable goods industries include wood products, non-metallic mineral products, primary metal, fabricated metal products, machinery, computer and electronic products, electrical equipment, appliances and components, transportation equipment, furniture and related products and miscellaneous manufacturing. For the aerospace industry and shipbuilding industries, the value of production is used instead of sales of goods manufactured. This value is calculated by adjusting monthly sales of goods manufactured by the monthly change in inventories of goods in process and finished products manufactured. Production is used because of the extended period of time that it normally takes to manufacture products in those industries. New orders are those received whether sold in the current month or not. New orders are measured as the sum of sales for the current month plus the change in unfilled orders from the previous month to the current month. For sales, based on the assumption that they occur throughout the month, the average monthly exchange rate for the reference month (noon spot rate) established by the Bank of Canada is used for the conversion. The monthly average exchange rate is available in CANSIM table 176-0064. Inventories and unfilled orders are reported at the end of the reference period. For most respondents, the noon spot exchange rate on the last working day of the month is used for the conversion of these variables. Some manufacturers choose to report their data as of a day other than the last day of the month. In those instances, the noon spot exchange rate of the day selected by the respondent is used. The noon spot exchange rate is available in CANSIM table 176-0067. Note that because of exchange rate fluctuations, the monthly average exchange rate can differ substantially from the exchange rate on the last working day of the month. Each month the Monthly Survey of Manufacturing releases preliminary estimates for the reference month and revised estimates for the three previous months. Revisions are made to reflect new information provided by respondents, and updates to administrative data. Once a year, a revision project is undertaken to revise multiple years of data. During annual revisions, changes are made to the seasonal adjustment parameters. Data from the July Monthly Survey of Manufacturing will be released on September 16. To enquire about the concepts, methods or data quality of this release, contact Michael Schimpf (613-863-4480; michael.schimpf@statcan.gc.ca) or Elizabeth Richards (613-863-4623; elizabeth.richards@statcan.gc.ca), Manufacturing and Wholesale Trade Division.